2) Go into List View by clicking the list icon at the top right hand corner of the page. 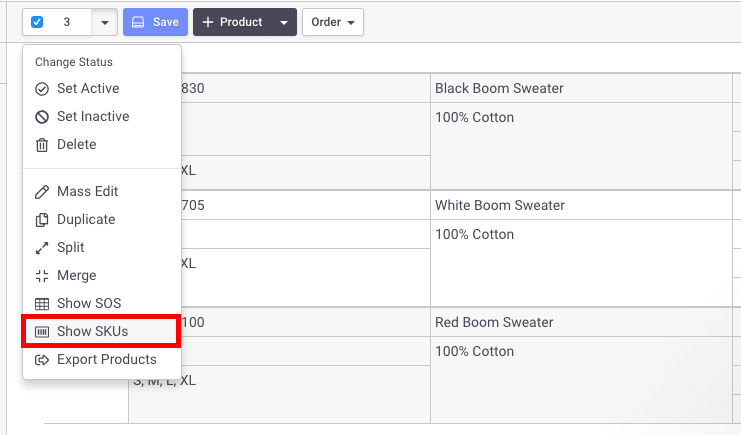 3) Select the products you would like to edit by checking off the boxes next to the product. 4.) Select the "show SKUs" under the product status bar and a new window will pop up. 5) Once you are in SKU mode, you can enter custom values for Price and Inventory. 6) The values you've edited will be highlighted in red and a tool bar at the top will prompt you to save changes. Hit save when you are finished making edits. You can sort the table by SKU, Style ID, Option Code or Size by clicking on their headings. This is an easy way to group similar styles together to be edited.